​​​​​​​​​​​​​​​​​​​​​​​​​​​​​​​​​​The Overhead Door™ Door Report™ remote is an innovative accessory that answers the nagging question, "Did I close the garage door?" 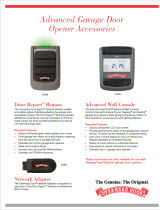 ​​The Door Report remote operates on 915 MHz frequency and communicates with up to three garage door openers via an Overhead Door™ Network Adapter (sold separately), which plugs into the opener. Its sleek and compact design provides intuitive use and function, but with minimal space requirements. It also features a visor clip for convenient placement. And because the Door Report remote is a hardware solution, it does not require ongoing fees. After purchasing Door Report, homeowners will enjoy the safety and comfort of knowing the contents of their home and garage are secure, without paying for a monthly technology system subscription. The Door Report remote only works with Overhead Door® Odyssey® and Destiny® garage door openers that feature powerful motors to lift doors quickly and quietly. Designed with safety and convenience in mind, both openers feature a bright lighting system, while select models feature a motion-detection system that activates the lights in the garage.